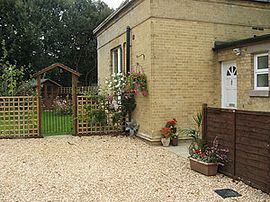 You are here: Holiday Cottages / Isle of Wight / The Lodge. The Lodge is single story and dates from the 1850s. It has recently been extensively renovated to form a perfect "home from home" holiday retreat. The Lodge is situated close to Queen Victoria's Osborne House. Pub, restaurant and shop are within 50 yards, and the shopping centre of East Cowes is within half a mile. The Osborne Golf Club is within walking distance, and visitors are welcome there. The Lodge is close to the River Medina, and the yachting centre of Cowes is just across the river. There are lovely country and riverside walks close by, and Osborne is ideally situated for visiting the many and varied Isle of Wight attractions. From the esplanade at East Cowes you can obtain a close view of ocean liners as they turn to and from Southampton Docks, or watch the yachting regattas which continue all summer long. 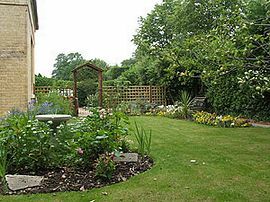 Alternatively you can just relax in the private lawned garden, watch the birds and enjoy the scent of the shrubs and flowers. The garden is particularlly safe for children and pets, being totally enclosed. Pets are welcome by arrangement at time of booking. There is ample off road private parking for two cars. More details available from owners website. 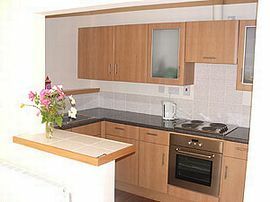 The property is maintained to a high standard, by the owners, on a weekly basis. The property is ideally situated for exploring the whole island. 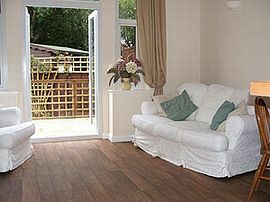 The Sitting Room opens onto the garden. Everything provided except beach towels. 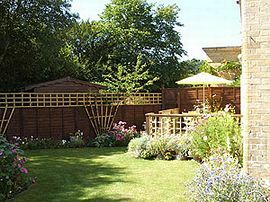 Fully enclosed private garden, safe for children and pets. Local Services: Excellent public transport links to the whole island. Detailed directions from the ferry terminals are supplied at time of booking. £350.00 to £775.00 per week. May to October bookings only.